A documentary about former President Roh Moo-hyun drew a record 78,737 viewers on opening day last Thursday and is being screened in 579 theaters across the country. "Our President" is being distributed by CGV Arthouse, a subsidiary of CJ-owned theater chain CGV, and 42 percent of the 579 screens belong to CGV. The conglomerate defended itself against accusations that it is pandering to new President Moon Jae-in, who was Roh's right-hand man, by choosing to open the film on such a scale. 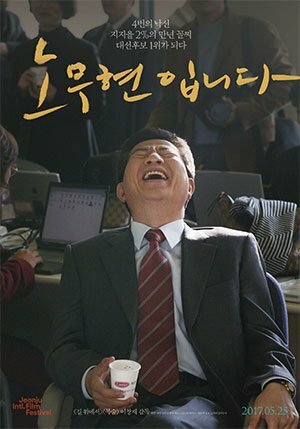 Another Roh-inspired film, "The Attorney", also attracted big crowds at the time of its CGV release in 2013 but landed CJ in hot water with Cheong Wa Dae, which tried to pressure the food and media conglomerate to fire those responsible, apparently because President Park Geun-hye had been irked by the film's progressive slant. "We didn't suddenly decide to distribute the film just before the presidential election in May", a CGV spokesman said. Director Lee Chang-jae said, "We decided to make the documentary in April last year, but we faced a lot of difficulties until it was finally released this year. If we couldn't find theaters, we were going to distribute the film on the Internet". He thanked the millions who took part in candlelight protests last autumn and winter calling for Park's impeachment and indirectly paved the way for a friendlier climate for the movie. Based on interviews with Moon and other Roh aides, "Our President" details the dramatic process of Roh winning the primary of what was then the Millennium Democratic Party, rising from a mere two-percent approval rating to become the party's presidential candidate in 2002. Roh was president from 2003 to 2008 and killed himself amid a corruption scandal shortly after he left office. Added new still for the upcoming Korean movie "A Day - 2017"